PLYMOUTH – The Plymouth Area Renewable Energy Initiative was joined by representatives of the New Hampshire Electric Cooperative, the New Hampshire Charitable Foundation, the New Hampshire Public Utility Commission, New Hampshire Community Finance Authority and other partners and supporters as they cut the ribbon on a new solar array last Friday that will benefit low income residents of Plymouth. The array is located behind Frosty Scoops ice cream off Route 3 in Plymouth, across the parking lot from Foster’s Boiler Room. When landowner Alex Ray heard about the project, he allowed PAREI to use the property for the new electrical initiative they were undertaking. It was NHEC President Steve Camerino who first presented PAREI with the idea of bringing solar energy to local families. Sandra Jones said her group was hesitant at first to take on such a project but eventually said yes to what they knew would be a huge undertaking. “We’re no longer an ‘initiative’; we’re here for the long term,” Jones said. To oversee the energy project, PAREI formed a separate legal entity known as N.H. Solar Shares, which falls under the 501c:3 nonprofit status of PAREI. Their decision, it turns out, came at a good time. 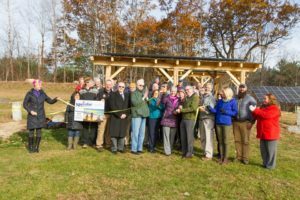 The New Hampshire Public Utilities Commission was just beginning a program to assist in such community projects and donated $86,000 toward the construction of the array, and the U.S. Dept. of Energy had also started a new grant program. Other local businesses made generous donations as well and soon a team of volunteers was busy clearing the land and preparing the ground for the solar panels. The workers also helped build two pavilions on the grounds near the panels where summer patrons of Frosty Scoops will be able to relax as they enjoy their ice cream. In all, Jones said 125 hours of volunteer time were accumulated in doing the groundwork. Construction of the pavilions, both made from chestnut, was 85 hours of volunteer time alone. Among the many who volunteered were members of the NHEC during the annual Granite United Way Day of Caring and others who pitched in during the Equinox Extravaganda earlier this year. “We wanted it to be a showcase,” said Jones. ReVision Energy was contracted to install the 90 solar panels and on Oct. 29 the 28.9kw system went online, generating 36,000 kw/hour to low income families. Electricity generated by those panels is being essentially put into an “energy bank” that will offset the energy costs for ten local families. In turn those families will take part in an energy education program through PAREI, where they will learn ways to save on their energy costs in the future. At the end of two years, those participants will “graduate” from the community solar program and pass their benefits on to another eligible family. Jones said they received 16 applications for the program, which also looked at income eligibility in selecting the first 10 participants. Barbara Spike was the first resident to be accepted and she was also at last week’s ribbon cutting to thank all who have brought the solar energy program to Plymouth. The array behind Frosty Scoops is just the first of a few planned installments, Jones said, with three more in mind for Plymouth, one in the Squam Lakes area, and another to be built in Warren in the near future. To help fund that continuation of community-shared solar power and energy education, N.H. Solar Shares is now in the process of applying for a $500,000 national award, which also offers a second prize of $250,000. Karen Cramton, director of the Sustainable Energy Division of the New Hampshire Public Utilities Commission was impressed by what PAREI and all the volunteers had accomplished in just under five months. As one of three projects that received money through the commission this year, Cramton said theirs was the first to go online and she congratulated them on a job well done. “We’re excited to see how this works out and hope to make it the model for others,” she said.